1. A spa pool cover saves you money. A quality tight fitting spa pool cover reduces spa power use. Spa pool covers have a thermal resistance (R) value of 2.28 and seal on the top of the spa virtually eliminate evaporation. This enables spa pool covers to save up to 70% of the spa pool heating energy requirements. Make sure your spa cover does not have any rips or tears as they will significantly reduce the insulation value and allow water into the foam core. 2. Spa cover construction: What to look for in a quality cover. Spa and swim spa hard covers are made by inserting two high strength polystyrene foam sheets into a vinyl outer. Make sure the spa cover vinyl is a proven u.v. resistant vinyl. The foam sheets should be reinforced with strips of aluminium. To prevent water pooling on the cover, the foam should be tapered to prevent water from pooling. Chlorine resistant plastic on the bottom of the spa cover should be used to eliminate bleaching. The central hinge should be strengthened to lengthen the cover life. Handles should be internally strengthened for extra strength and added longevity. The adjustable tie downs should be strengthened. Spa cover locking mechanisms should be provided to limit access. 3. Spa Cover Care: Prolong the life of your spa cover with these easy tips. Make sure to remove the spa cover when shock dosing. Remove the spa cover if dosing with algaecides. Never drag a spa hard cover. Try not to rest your spa cover on the ground. Prolong the life of your spa hard cover by using a spa cover lifter or spa cover caddy. Clean the cover vinyl with approved spa cover wipes or how water and very mild detergent. Use spa cover wipes or a vinyl protection spray to protect your cover. 4. Life Span: How long will a spa cover last? A good quality spa cover will last up to 8 years or longer depending on how it is treated. 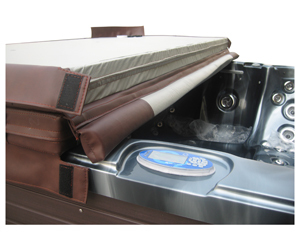 Replacement spa covers and custom spa covers can be purchased online at spastore.co.nz. Spa store carries spa covers for most brands and model sold in NZ over the last decade including O2 spa covers, Vortex spa covers, Sensation spa covers, Signature spa covers, Hot Spring spa covers, Sovereign spa covers plus many more. Spa Store has the ability to cater to custom spa covers of any size. 5. Spa cover safety: Does a locking spa cover and compliance to N.Z. safety standard NZ8500:2006 exempt me from the legal requirements of a fence? Your local council is required by law to enforce the fencing of swimming pools act. All councils currently have different interpretations of the act so you will need to contact them directly to determine requirements in your area. Click here to find your local council requirements. NZ8500:2006 was introduced in December 2006 and has yet to be adopted by councils or integrated into the fencing of swimming pools act. • Compliance to this standard is subject to the cover being installed and maintained as directed in 3.10 of the standard. • If you want to comply you must follow the installation and maintenance guidelines set out. • (k) removable steps, movable furniture, or other objects that can assist a young child to climb onto the cover, shall be stowed/stored away at least 1200mm from the side of the spa pool or hot tub. • failure to comply with 3.10 above will require a barrier/fence complying with the standard. Is your spa pool cover in good condition?